The three-month Winter session of the Mayfair West Singles Challenge Ladder begins on January 15th and runs until the end of April. This is your chance to play singles matches and be grouped with players based on your tennis rating. Box winners will receive monthly prizes and there will be session prizes handed out in at the end of the three-month session (January to April) for the players with the most points and for those who played all their matches. The cost to join is $30 + HST (which covers participation until the end of April) and registration forms will be available at the front desk. For more information, contact Josh Weissman at jweissman@mayfairclubs.com or at extension 4245. Our preschool levels are designed for students from ages 2-5. Students work on their floats, glides, flutter kicks, side breathing, front and back swim. Our swimmer levels are for all swimmers ages 6+. Swimmers are taught the proper swim techniques and skills. Our swim instructors works with each child individually to make sure that they are taught the proper swimming skills and techniques. Each student will be working on progressions steps throughout the session in order to accomplish the swim levels. Private classes, semi-private classes and or group lessons are available. All classes are 30minutes, 45minutes or 1hour. Semi-private classes and or group lessons are available. The Sport Fundamental program focuses on all stroke improvements, sprints and endurance changes. Participants will complete challenging skills sequences, covering all swim strokes and some pre-lifeguarding skills. This course is for students who have completed all swim levels and are looking for a challenge. Swim patrol training puts your child en route to lifeguarding. This unique swim class for parents and tots (5 months – 2 years) is a great combination of fitness and fun for everyone. Each 45-50 minute class includes an Aquafit workout for parents, followed by a parent and tot swim program. This program is designed for swimmers who have completed all of their swim levels and want to improve their overall physical fitness in the water. The swim team provides a structured approach based on training principles and practices. Participants will be encouraged to set their own goals through interval training. The Adult fitness swim program is for individuals seeking an alternative to conventional fitness. The program is designed to enhance competitive swimming abilities, improve swim stroke technique and personal fitness. With proper training, you will build up endurance so you can swim continuously without stopping. You will also improve swim strokes and breathing through drills. Refer a new swimmer and receive a $10.00 discount. (Referred students must have never taken swim lessons at Mayfair). 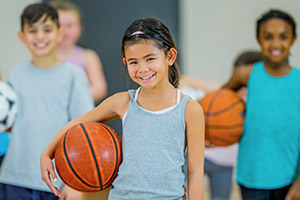 This Passover Break, fill your child’s days with learning specific sport skills and drills. Morning, afternoon and full-day options available, as well as lunch options at no additional cost. Recreational swimming is included in the afternoon session with the option for instructional swim (at an additional fee). Member pricing is $85 for full-day camp, $55 for half-day camp (non-member pricing available as well). To sign up, contact Laura Tichonchuk at westcoordinator@mayfairclubs.com or at extension 4248. Camp registration forms are also available on our website. The Easter bunny is stopping by at Mayfair West this year, so grab your baskets and join us in Kidspace for our Easter Egg Hunt! Price is $15+ HST per child (one hour of Kidspace is included). To sign up, please see Kidspace staff or contact Laura Tichonchuk at westcoordinator@mayfairclubs.com or at extension 4248. For more information or to schedule your appointment, contact (647)427-3036.